From the TV to the stage, the beloved finalists of Strictly Come Dancing are joined by a member of The Wanted, turning the West End upside down with the musical extravaganza of the season. This glorious quartet consists of Aston Merrygold and Jay McGuiness on the mic, Harry Judd on drums, and last but definitely not the least, Louis Smith performing spectacular gymnastic stunts (for which he has won 4 Olympic medals in 3 different Olympic events). And the best part is, it’s all set to some groovy tunes from the Swinging Sixties. Watch this amazingly talented quartet Rip It Up on the West End Stage with a performance to remember for years to come. 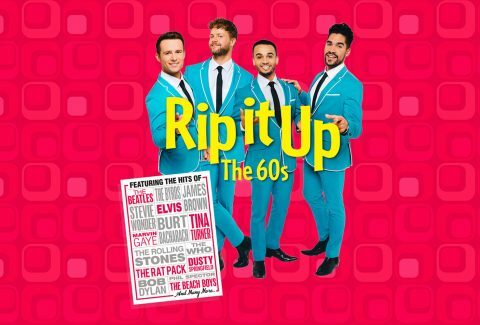 After a hugely successful UK-wide tour in 2018, Rip It Up transfers to the West End stage. And this time, we go back to the glory days of the 1960s, with a fusion of song and dance, with some amazing acrobatics and out-of-this-world visuals to go along with it. Accompanied by iconic melodies by some of the world’s greatest artists, including The Rolling Stones, The Beatles, The Beach Boys, Elvis Presley, Motown, Stevie Wonder and Aretha Franklin, audiences can expect a celebration of a revolutionary time with psychedelic music, culture, style and fashions. The quartet is supported by an incredible cast of singers, dancers, and the Rip It Up live band. Children below the age of 8 will not be admitted. The Garrick Theatre has a seating capacity of 718.